"How do you like your chocolate? With wasabi? Cola? Cigar smoke? Asparagus? Black olive puree” Standing inside the pint-sized The Chocolate Line and heady with the whiff of cacao beans, I dropped a jaw at Dominique Persoone’s questions. Before stepping into Brugge, the chocolate capital of Belgium , I had picked all essential chocolate trivia; I could even say theobrama cacao (the chocolate tree) in one breath, but Persoone was shocking my wits. He’s wont to: this Michelin star chocolatier calls himself a Shock-o-Latier. Persoone is a great story teller, but he is not the only chocolatier in Brugge. There are 50 boutique chocolate stores, with the medieval town even boasting of a Chocolate Museum and a Chocolate Festival ( November 11-13, 2011 ). The chocolate story in Brugge began at the end of the Middle Ages when enterprising Belgians imported cane sugar from Madeira and mixed with the cocoa introduced by the Spanish conquistadors. The Belgian chocolaty tale took an interesting twist when King Leopold II colonized Congo in 1885 and gained access to African cocoa grounds. In 1912, the first Belgian praline was rustled by the Neuhaus family. The rest, as they say, is history. My chocolaty trail too took a sweeter detour as I headed to Ghent , a town which from 1000 to 1550 was one of the most important cities of Europe – it was bigger than London and second only to Paris in size. Ghent was known for its textile industry, its “headstrong and obstinate” men and as the city of Stroppendragers (noose wearers). As I walked around the cobbled pathway, the largest pedestrianized square in Belgium , Nicky Temmerman of Tourism Flanders talked of the guillotine and thumbscrews in The Castle of Counts, the rococo pulpit in St Bavo’s Cathedral from where priests thundered sermons, and Dulle Griet pub where 250 different kinds of beer are stashed on the shelves. In Ghent , however, I shunned the beer and the torture instruments; instead, I was looking for Hendrik Mesuere, the chocolatier who now runs a three-bedroom hotel in a historic bolthole. Mesuere no longer works as a full-time chocolatier, but I was aching to do a four-hour chocolate-making course in his basement kitchen. Mesuere was packed and I was happy to be in Leonidas, founded by Leonidas Kestekides, who won a bronze medal for his chocolate confectionery in 1910 World Fair in Brussels. The Kestekides family sold white chocolates laden with hazelnuts and walnuts on street carts. That day, however, I found no manons; I picked the sinfully sweet Ghent Nose, a oh!so Ghent confectionery. Two days, too many chocolates, and I was already tipping dangerously on the weighing scale. But my chocolate trail was not yet over. My next stop was Antwerp, the diamond hub. Little did I know that in Antwerp, I would find diamonds, a king, an emperor and chocolates under the shimmering roof of what the Belgians call “the world’s most beautiful chocolate shop”. In the former Royal Palace, 35 million Swarovski crystals have been used to embellish the white arch, King Loepold III stands on a pedestal scultped in chocolate, so does Napoleon Bonaparte, who lived in the Palace during the French Occupation. But there were no Antwerp Hands, a chocolate shaped like a hand which was originally created by Rene Goossens. My search for those famed sweet hands took me to Burie, a small artisanal chocolate store that changes its window dressing every month and is known for its diamond chocolates and Antwerp hands. But Burie was closed on Sunday, all I could see was the towering chocolate Leaning Tower of Pisa in the 49-year old store that ranks 68 on Lonely Planet’s list of 459 food drink and shopping in Europe. Day 4. Monday. Brussels. Even before I could bite into Laurent Gerbaud’s salty/sweet chocolates, I learnt by rote his cocoa Ten Commandments: “I swear to god. Our chocolates contain: No added sugar. No butter. No gin. No preservative. No soy lecithin. No artifiical flavours. No additives.” So many nays, but how so melt in the mouth? I wondered. “It is full of love”, Gerbaud laughed, his eyes glistening from behind his thick, black spectacles. Beyond the love, he throws in “ingredients that are precious and noble”. Like the Trinitario beans that come from Sambirano Valley in Madagascar and Nacional beans that are exclusively grown in Ecuador. Ever heard of noble beans? I did not. A chocolate must-do in Brussels is Pierre Marcolini, the man credited with the makeover of Belgian chocolates: from conservative to cutting-edge. His chocolates are so pretty that it seems sacrilegous to bite into them, one would rather frame them in gilt and hang them as priceless work of art. His store is minimal in décor, his chocolates expensive, his macaroons scrumptious, and his marshmallows savoury. My chocolate trail, like all chocolate pilgrimages in Brussels, ended with Mary, the grande dame of Belgian chocolate. Since 1919 Mary has been sitting smug in rue Royale, Brussels’ smartest street. Walk in and you’d think you have stepped into a mammoth Faberge egg cluttered with Louis XV furniture. But the opulent trappings fail to distract the chocolate lover from what Mary makes best: dark-chocolate mousse with Earl Grey tea and white-chocolate mousse with cinnamon. Four days. Four cities. Mounds of chocolate. 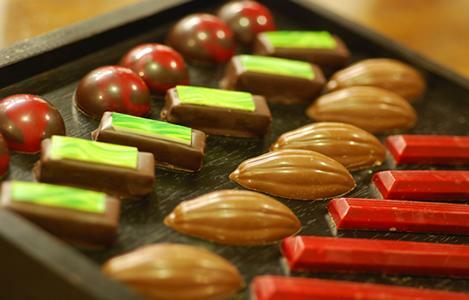 And an unforgettable chocolate trail in Flanders. I am back home. I am so happy. I am full of glee. Is it because of the happiness hormone in the chocolate? Or, did that drop of wasabi in the chocolate perk my happiness quotient? I’d never know. However, next time, my happiness meter dips, I know where to go. Flanders. Where else?